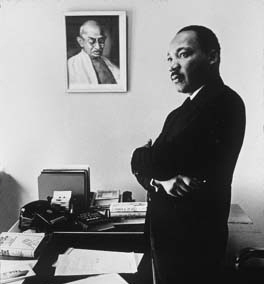 KXCI is pleased to devote a day of programming to help commemorate the life and legacy of the Reverend Martin Luther King, Jr.. We featured a day full of music, excerpts from Dr. King's speeches and people from Tucson who strive to continue King's work. Some people came to the KXCI studios to record, and we also went into the community to record. You can listen to all of the segments here. We went to the 26th Annual Drum Major Award Luncheon to record TUSD MLK Essay winners on Friday January 13th. Dr. King gave a sermon at the Ebenezer Baptist Church called the Drum Major Instinct where he implored; people to use their inherent sense of importance to be a drum major. "If you want to say that I was a drum major, say that I was a drum major for justice. Say that I was a drum major for peace. I was a drum major for righteousness." Each year, the luncheon raises funds for the local Tucson march and honors people who exemplify the Drum Major Instinct in a positive way in our community. On Saturday, January 14th we went to the 22nd Annual Pueblo Gardens Neighborhood Association Breakfast and recorded local speakers and youth bully prevention ambassadors. This annual event raises scholarship money for local students. Livian Stokes, Dodge Middle School MLK Essay Winner. You can listen to all of the links here.